NYERERE AGAINST ISLAM IN TANGANYIKA AND ZANZIBAR - Msamaa. "Without any question, the manner and the implications of the union between Tanganyika and Zanzibar is the most misunderstood aspect of Tanzania's political development. It may not matter very much when foreigners get confused, but unfortunately there are many times when Tanzanians themselves appear to misunderstand it." Former Tanzanian President Julius Nyerere. Dar es Salaam Government Printer, July 1970. p. 3. When the former Tanzanian President Julius Kambarage Nyerere made the above address to his National Assembly that "the union between Zanzibar and Tanganyika is the most misunderstood aspects of Tanzanian's political development" proved that he is the only Tanzanian who knows "the manner and the implications of the union" after British colonialism in East Africa. During the British colonialism, Zanzibar was the only intellectual center for Islamization of East African countries under the Zanzibar Sultanate. The Gofu and the Barza Mosques allowed students from the East African countries for the Islamic education. The Zanzibar Muslim Academy also offered the greatest hope for the vibrancy of Islam in East Africa. Nyerere, a devout Catholic saw that the Islamic Zanzibar state, a threat to Christianity. He masterminded a clandestine movement for the so called Zanzibar Revolution under the leadership of John Okello, a radical Christian from Uganda. It was not only a prelude to the creation of Tanzania, but a continuation of crusade against Islam and extension of Christian colonialism. The Zanzibar Empire under the Sultanate stretched from Cape (Rãs) Asir in the Banadir coast of Somalia to the Ruvuma river at the Cape Delgado, and inland beyond the great lakes. In addition, its ruler held sway over all the south-eastern corner of Arabia. His influence stretched beyond even these extensive borders. At the time of the heyday of the Empire, Zanzibar became celebrated in the well-known saying that: "When you play flute at Zanzibar, all Africans as far as the Lakes (Tanganyika, Malawi and Victoria) dance." This Zanj Empire has passed, but much of its influence remains. Swahili, identified as an Afro-Islamic language is one of the first seven most principal languages of the world. It has spread far and wide from Zanzibar to Congo, the fomer Zaire. In Southern Arabia, Western India and Madagascar, there are people who speak Swahili. Many of the Creoles in Mauritius and Rêunion are of Zanzibar origin. Their language, though French in its vocabulary, is Swahili in its grammar. One may even hear in the Creole of Mauritius folk-lore similar to the Swahili of Zanzibar. It was recently in 1960's that Tanganyika, Kenya and Uganda adopted Swahili as their national and political, but not the official language unlike Zanzibar. Its nationality was possible due to the non-ethnic identity of Swahili, according to some allegation. Therefore, Swahili is the language of Muslims in East Africa, similar to Arabic in the Muslim world. The Zanzibar Swahili, derived from the Sumarian dialect is the only language which has borrowed a higher proportions of its vocabulary from Arabic than English has from Latin. But soon after the demise of the Anglo-Dutch Colonialism in East Africa, Zanzibar was kept in isolation from the Muslim world since 1964 due to the fact that it was the only country in East Africa where the Islamic Law was the fundamental law of the country. Zanzibar was not only the most active opposition to aggressive encroachment of the Christian powers from Kenya to Tanganyika, but the intellectual center of Swahili culture and Islamic education in this African region. Former Principal of the Zanzibar Muslim Academy, Sheikh Sayyid bin Omar bin Abdullah bin Abu Bakr bin Salim (1917-1988), graduated from the Oxford University of London stated that the Zanzibar islands were instrumental in the penetration of the Shafi'i school to Tanganyika (Tanzania), Kenya and Uganda around the period of Abu Hamid Muhammad al-Ghazzali (1058-1111), a Professor of Nidhamiyãh Shafi'i Muslim Academy in Baghdad and disciple of Abdullah Muhammad Idriss al-Shafi'i (767-820), founder of Shafi'i School of Jurisprudence. This can be substantiated by the globetrotter from Morocco Abu Abdullah ibn Muhammad ibn Abdullah ibn Muhammad ibn Ibrahim al-Zawati al-Tunzi (1304-1378), famous as Ibn Batuta who visited the East African Muslim islands, including Mombasa and Pemba, the two sister islands of Zanzibar. He explained the presence of Muslim community with Islamic Schools, scholars of Shafi'i Fiqh (Jurisprudence) and descendants of the Prophet Muhammad (pbuh) in the East African islands. Sheikh Abdullah Saleh al-Farsy (1912-1982), an international historian and great ulama of Zanzibar has described some intellectual Shafi'i ulama of Zanzibar during the Sultanate, though it was under the British Colonialism. The Sultans used to send Shafi'i scholars to Tanganyika for its Islamization. During colonialism, Islamization of Tanganyika started from Zanzibar where Sheikh Muhyddin bin Sheikh bin Abdullah al-Qahtany (1789-1869), the Chief Qadhi and Prime Minister of Zanzibar under Sultan Said bin Sultan (1806-1856) had numerous local students. Sheikh Muhyddin bin Sheikh Abdullah al-Qahtany authored many Arabic books, including Takãlibun al-Haruf, his famous one on nahw (grammar) which he taught this text at the Masjid al-Haramyn in Mecca, but his most popular book in the West is the redaction of the well known Kitãb as Sulwa fi Akhbar Kilwa (The History Book Concerning the Pleasure of Kilwa), first translated into English by S. Arthur Strong in 1875 under the title Arabic Kilwa Chronicle. But its Arabic version of Sheikh Muhyddin al-Qahtany was donated to the British Museum (Or. 2666) by John Kirk, a British colonialist in Zanzibar (1873-1887) during the reign of Barghash bin Said bin Sultan (1870-1888), whose first printing press in East Africa under the directorship of Sheikh Ali bin Khamis bin Salim bin Barwan (1852-1885) was used for the publication of al-Najah (The Success), Pan-Islamic newspaper which had a wide subscription outside Zanzibar to Algeria, Egypt, Oman and Libya. Sheikh Muhyddin bin Sheikh bin Abdullah al-Qahtany had numerous students in Zanzibar similar to Sayyid Ahmad Abu Bakr al-Sumait (1861-1925) and Sheikh Abdullah Abu Bakr Bakathir (1860-1925), the two intellectual Shafi'i scholars in East Africa. One of their famous itinerant students was Sheikh Hassan bin Ameir bin Hassan al-Shirazy (1887-1986), a graduate of al-Azhar University. In Zanzibar, he studied under Sheikh Abdullah Amour al-Azry and Sheikh Abdul Rahman bin Mahmoud al-Washil Mngazija (1872-1936) as well as Sheikh Muhammad bin Ali Muhammaad al-Mandhri (1825-1895) and Sheikh Muhammad bin Abdulla bin Wazir, the first person who translated the Qur'an into Swahili language. Sheikh Hassan bin Ameir bin Hassan al-Shirazy taught at Makunduchi, his birth place before Muyuni and Kiembe Samaki Primary Schools. He became a town clerk and later resigned for accepting a post of a Qadhi at Chake Chake in Pemba where he taught many students. Of his famous student was Sheikh Said bin Omar bin Abdullah bin Abu Bakr bin Salim (1917-1988), known as Sheikh Msaada. He graduated from the Oxford University and was the last Principal of the Zanzibar Muslim Acedemy. His other student was Sheikh Fattawi bin Issa bin Hassan bin Musa al-Shirazy (1900-1987), born at Makunduchi (South of Zanzibar) and was appointed the Qadhi at Mkokotoni (North of Zanzibar) at the age of sixteen under Sultan Khalifa bin Haroub bin Thuwein (1911-1960), and taught at Makunduchi for many years until he was appointed the Chief Qadhi. Sheikh Ameir bin Tajo bin Ameir al-Shirazy, also born at Makunduchi was one of the most political activist students of Sheikh Hassan bin Ameir and Sheikh Fattawi bin Issa. He was one of the founders of the Shirazi Association and the Zanzibar and Pemba People's Party (ZPPP) and became the Chief Qadhi of Zanziabr after Sheikh Fattawi bin Issa. Sheih Hassan Ameir Hassan authored many books in both Swahili and Arabic, including Al-Iqd al-Iqyãn alã-Mawlid al-Jailãni which is used by the Qadriyyah Muslim Brotherhood throughout East Africa. He also taught and wrote several Islamic books at Zaire and Malawi as his teacher, Sheikh Abdullah bin Mjana bin Kheir, born at Mkokotoni in Zanzibar who also taught Zaire and Malawi. The first Muslim from Zanzibar to Malawi was Salim bin Abdullah, who lived at Nkotakota from 1840. He was given a title of Jumbe (chief) and encouraged the Yao and Chewa chiefs to send their sons and nephews to Zanzibar to study Islam. Although the Jumbeship was abolished by the British colonialists in 1895, Nkotakota is the most strong hold of Islam in Malawi until today, predominantly by Yao and Chewa. Sheikh Hassan bin Ameir bin Hassan al-Shirazy was the instrumental figure for Islamization and political movement in Tanganyika under the auspices of the Zanzibar-based Qadriyyah Muslim Brotherhood. According to Professor August H. Nimtz, he was "the most popular teacher in terms of students in Tanzania." He left Zanzibar in 1940 for Dar es Salaam, where he built his patronized Islamic School, Madrãsatul al-Shiraziyyah (The Shirazy School) at the Comorian Mosque. He founded the Daw'at al-Islamiyyãh (Invitation to Islam) and a member of the Jamiyyãt al-Islamiyyãh fi Tanganyika (Tanganyika Muslims Association) founded in 1934 by Kleist Sykes and advisor of the East African Muslim Welfare Society (EAMWS), founded in 1945. It was not until recently when the study of Islam in East Africa has attracted much attention of contemporary scholars. But most of them neglect the Crusades against Islam in East Africa, and Zanzibar in particular. It is neglected because such a religious conflict seems to belong to the Middle East, despite the Crusade against Islam is ecumenical imperative in any Muslim country, including Zanzibar. In case of the Catholic Crusade in Zanzibar, Nyerere worked hand in glove with Oscar Kambona, his close confidante and schoolmate at the Edinburgh University, where in 1910, the Second World Conference of Churches (WCC) discussed the threat to Islam in East Africa. It was unanimously agreed that an African Christian is better (for leadership) than an African Muslim. Every sort of assistance was therefore given to Nyerere in order to combat Islam in East Africa after the demise of the British Colonialism. We (Nyerere, Obote and Kenyatta), the leaders of the people and Governments of East Africa (i.e. Tanganyika, Uganda and Kenya)...pledge ourselves to the political federation of East Africa and we are prompted by the spirit of Pan-Africanism, and not by mere selfish regional interests. (p. 1). Go now, you rich men, weep and howl for your miseries that shall come upon you! Your riches are corrupted, and your garments are moth-eaten. Your gold and silver is cankered, and rust of them shall be a witness against you, and shall eat your flesh as if were fire. You have reaped down your fields in cries of them which have reaped are entered into ears of the Lord of Sabbath. You have lived in pleasure on the earth and been wanton. You have nourished your hearts as in a day of slaughter. You have not, you kill and desire to have and cant obtain fight and war, yet you have not asked, and receive not, because you ask amiss, that you consume it upon your lusts (James 5:1-6). I am Fidel Marshal! Okello! You imperialists, there is no longer an imperialist government on this Island. This is now the government of the Freedom Fighters. Wake up you black men. Let everyone of you take a gun and ammunition and start to fight against any remnants of imperialism in this islands. (p. 143). In the same morning, Okello issued an ultimatum to Jamshid bin Abdullah bin Khalifah bin Haroub (1963-1964), the Zanzibar Sultan: "You are allowed twenty minutes to kill your children and wives and then kill yourself." (p. 145) but he escaped through Mombasa, Kenya. The mainland Africans' support to overthrow the Zanzibar Government was due to the fact that the Crusaders had a large number of modern arms from Kenya and or Tanganyika from where 600 Crusaders invaded Zanzibar Keith Kyle, a British correspondent for East Africa in his articles in the Spectator of entitled "Gideon's (Okello) Voices" (February 7, 1964) and "How it Happened" (February 14, 1964) said that "certain (Christian) members of the Tanganyika Government were involved in Revolution" (Crusade) of Zanzibar. It is known that the holocaust was so horrendous that 100 Muslims were baked to death in tanuri (the copra-kiln) at Bambi. Following the Muslims holocaust, Abeid Karume (1905-1972), born in Nyasaland (now Malawi) became the President of the People's Republic of Zanzibar. Karume secretly collaborated with the former Tanganyikan President Nyerere, an Islamophobic for the merger of Zanzibar and Tanganyika. Similar situation took place in Mindanao, an Islamic State founded by Sultan Sayyid bin Abu Bakr al-Hadhramy over 400 years before the ascendancy of the Roman Catholic Church in the Philippines and Tanganyika. One day after the Crusade in Zanzibar, the Kenyan African National Union (KANU) Youth Wingers held an emergency meeting in Nairobi. In this meeting, "a unanimous resolution was passed hailing the overthrew of the Zanzibar regime." This was followed by the two-days Kenyan Cabinet Ministers, summoned to the Prime Minister's Office. It was attended by the Tanganyikan Minister for External Affairs, Oscar Kambona, a member of the World Council of Churches, and the Ugandan Minister of State, Magezi, while the Kenyan Minister of State and Foreign Affairs, Joseph Marumbi was in touch with Zanzibar by telephone. He collaborated with Edington Kisasi, a Catholic from Moshi in Tanganyika who was the Zanzibar Superintendent of Police installed by the British and he became the first Police Commissioner after the Crusade in Zanzibar. Also attended the Cabinet meeting to discuss the aftermath of Crusade were the British High Commission in Kenya, the British Forces in Kenya, and the Inspector-General of Police, R.C. Cating. We sent our police to Zanzibar. After overcoming various problems we united. We ourselves voluntarily agreed on union. Karume and I met. Only the two of us met. When I mentioned the question of the union Karume did not even give it a second thought. He instantly asked me to call a meeting of the press to announce our intention. I advised him to wait a bit as it was too early for the press to be informed. (p. 31). In such a religiously divided country, the issue of religion was a sensitive one, and in 1965 the situation was no different from 1961 in this respect. In fact, it could be argued further that it was even more sensitive after the revolution in Zanzibar in 1964, when the Arab sultan was overthrown and the Islamic State of Zanzibar ceased to exist. This change constituted a serious blow to those Muslims....(p. 90). A similar situation of ethnic cleansing and the holocaust that went with it, was attempted to turn Bosnian Muslims into the Christians, and bring Bosnia-Herzegovina into the "Greater Serbia" under the Greek Orthodox Serbs or "Greater Croatia" under the Roman Catholic Croats since 1941. The same experiment was successfully conducted by the Catholics to the Mindanao Muslims. They were forcibly merged with the Philippines in 1946 by the American government "to civilize and Christianize the Muslims" as said by William McKinley, the assassinated US President (1891-1901) who had invaded the Philippines and the Mindanao islands. After the merger, the Muslims were considered outcasts in their own land and establishment of the Catholic Churches was encouraged but the Muslim world seemed to have lost its sense of history and treat the problems of Mindanao as if it were purely internal affairs of the Philippines and as if the Muslims were always ruled by a Catholic establishment. The geopolitical limbo between Zanzibar and Tanganyika is a continuation of Christian colonialism under the clique of Catholic leadership. As in the Philippines, where thousand of Catholics were sent in exodus to overpopulate the Muslims in Mindanao, the Catholics in Tanganyika are sent to overpower the Muslims in Zanzibar. They worked to remove any immigration restrictions from Tanganyika to Zanzibar as done by Catholics from the Philippines to Mindanao islands. Similar to the Muslim legacy in the Mindanao, Christianization of Zanzibar islands in the next millennium, will be the greatest achievement of Nyerere and the history of the Catholic Church Movement (CCM) in Tanzania at large, and Africa in general. It appears that Nyerere is one of the best known political figure, but the least understood of African leaders. Millions of Africans who struggled for liberation from the Western imperialism, believed that Nyerere is the supreme theoretician and practitioner of the African Liberation. Others concidered him as the man who committed himself and the resources of his country to rid the African continent from the hegemony of European colonialism and apartheid, sponsored by the Ducth Reformed Church, the major evils of Western imperialism in the African history. According to some political philosophers, Nyerere is the most outstanding political guru, thinker, writer and spokesmen in Africa and the chief architect of socialism in Tanzania, branded as "Romantic Tanzaphilia" by Professor Ali A. Mazrui. Union was imposed on the Muslims of Zanzibar by Nyerere, a militant Christian and his henchmen Okello against the will of the Zanzibari people, and that has been followed by a deliberate campaign to extinguish the Islamic character of Zanzibar under a secular constitution." (p. 170). We wish to assure all the so called Zanzibaris that anything short of an African state will never be accepted when self-government is achieved in this Protectorate. We are also opposed to multi-racial government in these islands. It is against all this Association stands for. We want Zanzibar to become an African state like the Gold Coast. (Afrika Kwetu, May 5, 1955). Nyerere manipulated Abeid Karume to merge the African Association (AA), a surrogate of Tanganyikan Association (TAA) under Nyerere, with the Shirazi Association (SA), whose President was Thabit bin Kombo bin Jecha al-Shirazy (1904-1988), a Muslim born at Kizimkazi in Zanzibar. Nyerere formed Afro-Shirazi Party (ASP) on February 5, 1957 but under Karume. Consequently in 1960, Sheikh Muhammad bin Shamte bin Hamad al-Shirazy, a school Principal born at Chambani, Pemba and Sheikh Ameir Tajo Ameir al-Shirazy, formed the Zanzibar and Pemba Peoples' Party (ZPPP) whose Secretary General was Abdullah Amour Suleiman al-Shirazy, born at Pemba. He was the editor of Mwangaza (The Light), the mouthpiece of the ZPPP, believed as the sole party for the indigenous Muslims in the Zanzibar and Pemba. Orientalists emphasize the differences between the Africans and Arabs but ignore the impact of Islam, which is so strong in Zanzibar politics that led the coalition of the ZPPP and Zanzibar Nationalist Party (ZNP) in 1961, after the ASP had failed to win the support of the ZPPP to form a coalition force for the so called African independence. Following their discussion with Sheikh Ameir Tajo Ameir and the ZNP delegates flew to Pemba for discussion with Sheikh Muhammad Shamte Hamadi. Other delegates were Sheikh Miraji Shaalab, Abdul Rahman Muhammad Babu, Sheikh Maalim Hilal and Sheikh Ali Muhsin. The Minister of Home Affair has by command of the President (Julius Nyerere) declared the Tanzania Branch of the East African Muslims Welfare Society (EAMWS) and Tanzania Council of the East African Muslim Welfare Society to be unlawful societies under the provisions of section 6(1) of the Societies Ordinance. (The Standard, December 20, 1968). The advisor of the EAMWS Sheikh Hassan bin Ameir al-Shirazy was arrested and deported to Zanzibar. The Jamiyãt al-Islãmiyyah fi Tanganyika, which focused on the pressing educational needs of Muslims in Tanganyika was also banned in 1970 in the gist of secularism of education, before the government expressed its hostility in 1973 that only adults could perform Hajj (pilgrimage) to Saudi Arabia and only once in their life time. Some Christians are hostile to Hajj because it is used for the enhancement of the global Muslim Brotherhood and enrichment of the Islamic education among the pilgrims. Nyerere's vicious Crusade against Zanzibar to join the Organization of Islamic Conference (OIC), was unprecedented. His government suggested in 1988 to change the name of Dar es Salaam (The House of Islam), the capital of Tanzania where the Popal Office is represented for the African continent. But hostility to Islam was manifested on May 7, 1988 during the Conference of the ruling Chama Cha Mapinduzi (The Party of Revolution) at Dodoma. Under his Chairmanship in the Conference, the Chama Cha Mapinduzi suggested the abrogation of Islamic Law in Tanzania, though 65% of its population is Muslim. This political crusade under the auspices of the rulimg party, triggered a mammoth demonstration in Zanzibar on May 9, 1988 by Muslim youth after the Juma’a (Friday) prayers during the month of Ramadhãn. While the Muslims protested and demanded restoration of the Islamic State in Zanzibar, a massive police contingent, armed with clubs, tear gas and guns attacked the protesters. In the shooting, Ali Mansour Ali, active member of the Dãwat al-Islamiyyãh, was martyred. One of the protesters died the following day in the General Hospital among other hundred who were hospitalized but scores, including female Islamists were accused of "inciting" instability against secularism. It was imposed by Nyerere in 1979 when he addressed some Muslims at the Beit al-Ajaib (The House of Wonders) in Zanzibar. Adding the fuel to the fire, the police arrested four ulama, including Sheikh Nassor bin Ali, imam of the Kikwajuni Mosque. They were accused of being the instigators of the demonstration because shortly after of theirKhutba (sermon) in the Muslim youths mass demonstration protesting the blantant suggestion for the abbrogation of Islamic Law in Tanzania. After the mass demonstration, Seif Shariff Hamad, the then charismatic Chief Minister of Zanzibar (1984-1988), famous for being outspoken and his sentiments were linked with Islam, was sacked with his six colleagues; namely Soud Yusuf Mgeni, Minister for Agriculture and Livestock Development as well as member of the National Executive Committee (NEC) of the ruling party of CCM. Others were Hamad Rashid Muhammad, union Deputy Minister of Finance, Planning and Economic Affairs, Suleiman Seif Hamad, Deputy Speaker of Zanzibar House of Representative, Khatib Hassan Khatib, Member of Parliament, Shaaban Khamis Mloo, Member of House of Representative, Ali Haji Pandu, Member of House of Representative and Minister of Natural Resources and Tourism also former Chief Justice and Masoud Omar Said, Minister of Education. Ali Saleh, a freelance journalist who informed the BBC about the Muslim protest in Zanzibar against abrogation of Islamic Law in Tanzania, was thrown into jail and more Christian soldiers were sent to contain the Muslim "fundamentalists" in Zanzibar. This was accordance with recommendation of the American CIA for the creation of Tanzania. It was recommended by William Attwood, the then US ambassador in Kenya that "the Western powers prepared a contingency plan in case the Union would fail...and (after the union), the laws of Tanganyika would become supreme to round up (Muslim) radicals in Zanzibar." The situation was aggravated by the Crusadic visit to Zanzibar in March 1989 of Nyerere, whose well publicized speeches called for tougher repressive measures against what he described as "dissidents" in Zanzibar, where Islamists interpreted his visit and speeches as a CCM conspiracy against Islam. As interpreted, his visit led to massive arrests of leading public figures, including Seif Shariff Hamad, who was jailed for allegedly being in possession of secret government documents. He was then purportedly rumored by the CCM on charge of being foreign agent and adui (enemy) of the Union though many young Islamists in Zanzibar extolled him as shujaa (hero) and charismatic leader. He was released in 1991 due to pressure from the Amnesty International. Prior to his prominence in Zanzibar, Seif Shariff was so active in Islamic movement that he had served as the president of Muslim Students Association of the University of Dar es Salaam (MSAUD), and he worked with Professor Muhammad Hussein Malik, an Islamist from Pakistan who came to Dar es Salaam in 1964. Both Islamists had played a formative role in the ideological development of Muslim Youths in Tanganyika and formed Workshop ya Waandishi wa Kiislamu (Muslim Writers Workshop) in 1975. It was unprecedented that Professor Muhammad was forced to leave Tanzania. When Seif Shariff returned to Zanzibar, he challenged the status quo and became the most favored leader of the opposition party, the Civic Union Front (CUF) in Zanzibar for the 1995 general election in Tanzania, the last East African country to reluctantly accept the inevitable of multi-partism for power sharing. The state control media favors the CCM which received TShs. 250m (£330,000.00) for her campaign, while the CUF was given only TShs. 1.5m (£1,562.00). Members of the electoral commission are predominantly Christians and some are apologetic to Christianity or puppets of Nyerere who is pathologically opposed to any Islamic leadership for the betterment of the Christian Church Movement in Tanzania. Jan P. van Bergen's book quoted Nyerere by saying that the interest of his (Roman) Church came first, and would never go against his Church so as to liberate it from the matope (mud), which it has accumulated by being identified with world situation in Europe. 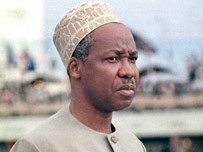 This is clear testimony indicated that Nyerere ruled his country for the betterment of clandestine Catholic Church Movement (CCM), in Tanzania and Muslims in this country were the first in the world who contributed money to the Catholic secessionist state of Biafra in Nigeria to fight against their fellow Muslims in Nigeria, the most populous Muslim nation in Africa. The Catholic Church Movement in Biafra demanded to secede to rid themselves in what they called "a calamitous slavery in an ocean of Muslims." In contrary, a number of Muslim troops from Zanzibar were disproportionately killed during the Nyerere's invasion of Uganda in 1979 which toppled a Muslim ruler, Iddi Amin and re-installed Nyerere's old friend, Milton Obote, a Christian who supported Nyerere for the creation of Tanzania in collaboration with the Central Inteligence Agency (CIA) whose director was George Bush, later the former US President. Their huge Christian Churches as well as many seminaries and proliferation of foreign priests and sisters in Tanzanian Churches, is a firm evidence that Christian organizations in Tanzania are affiliated with and used by foreign countries, because they can not through their local donation alone to carry out such activities and finance the lavish-style of their Church leaders. All the Churches and monasteries in Tanzania are the property of the Western nations, from where they recieve their orders and budgets for evangelism. For instance, the Tanzanian Catholic Church is the property of Italians, Portuguese, Spaniards, Belgians and French, the Lutheran Church is the property of Germans and Dutch, the architect of the apartheid in South Africa. The Anglican Church is the property of the British, the Moravian Church is the property of the Nordic countries, the Church of Pentecostal Assemblies of God, Seventh Day Adventists and African Inland Mission, among others are the properties of the United States. Further evidence of their affiliation is that all the Churches in developing countries, including Tanzania are referred to as "provinces" meaning that they are a sort of institutional chapters, and that their highest leadership is from the Western countries instead of host countries. The proliferation of Western Churches in Tanzania, led to the formation of many organizations such as the Tanzania Episcopal Conference (TEC), the Catholic Secretariat representing the largest Christian denomination; the Evangelical Lutheran Church in Tanzania (ELCT), representing the non-Catholic denomination; the Christian Council of Tanzania (CCT), comprising of Protestant Missionary Societies, the Office of the Anglican Archbishops, the Office of the Archbishop of the Greek Orthodox Church and the National Spiritual Assembly of the Bahais, among others. The Tanzanian Churches are affiliated either with World Council of Churches or Lutheran World Federation. In contrast, the Muslims in Tanzania are marginalized and they are not allowed to be affiliated with any global Muslim organization, whether the Organization of Islamic Conference (OIC) or the Islamic Organization of Africa (IOA), in the gist that Tanzania is a secular state, despite the fact that secularism is a Christian ethos of governance (Matthew 22:21) and mimicked from the Western nations like the Unites States. Ironically, that Tanzania is a member of the Commonwealth, whose chief should always be the head of the Anglican Church of England, the former colonial ruler before the ascendancy of Nyerere in Zanzibar and Tanganyika. The enmity which could be stirred by the evil minded between Muslims and Christians as we all know, the colonial government did not concern itself very much with education and therefore the majority of those who managed to acquire did so in the mission schools, and are therefore mostly Christians. Here again, then we have a division by its very existence constitutes a political threat to unity. (p. 179). The Muslims in Tanganyika who pioneered and led the grassroot struggle against the Anglo-Ducth colonial rule to end oppression have not reaped the fruits of their labor since the 1961 independence. Many questions are now being asked by the contemporary Muslims about this bag puzzle. Educational disparity between Muslims and Christians goes on abated. In Tanganyika, Muslims claimed that they have been marginalised in their own country before and after independence. Their past experience with Nyerere convinced them that it is unfair to expect Christian, however sincere or honest he might appear to the public, to safeguard the interest of Muslims. He vowed not to improve the level of Muslim education in Tanganyika and Zanzibar. Recent study conducted by G.A. Malekela, a Christian Professor in the Faculty of Education at the University of Dar es Salaam, stated that in the government Secondary schools in Tanganyika in 1983, Christians were 78% and all non-Christians were only 22%. Christians are clearly over represented despite the fact that Muslims are 65% in the population of Tanganyika. The latest research done by the Dar es Salaam University Muslims Trusteeship (DUMT) and published in 1992 by Al-Haqq International showed that the number of Muslim students has been falling in the country's university Dar es Salaam and colleges. At the University of Dar es Salaam alone, the research reported that the total enrollment for the 1986-1990 was 4,191. Out of this number, Muslim students were only 586, or 13%, whereas Christians were 3,609 or 87%. It is was not therefore a sheer coincidence throughout his uninterrupted 24 years as the President of Tanzania (1961-1985), Nyerere, being a Catholic had always appointed a Christian to head the Ministry in Education. Muslims stated that because of this ever-increasing under-representation of Muslims in relation to Christians in Secondary and Higher Education, all key posts in the Tanzanian administration and public institutions came to be dominated by Christians, while Muslims largely relegated to menial positions such as drivers and messengers. The Muslims in Tanganyika are demanding their a fair share of the national cake because after independence, Tanganyikan Muslim student intake, is below 10%; the Muslim Cabinet ministers are negligible while Muslim principal secretaries and heads of parastatal organization are non-existent. But like Tanganyika, the Muslims in Zanzibar have been discriminated against education in foreign countries after the forceful union of Tanganyika and Zanzibar to form Tanzania. Mohammed Mwinyi Mzale, the then Minister for Education in Zanzibar stated that of the 12 members of the Joint Selection Committee (JOSECO) which selects students for higher education in university and institutions at home and abroad, none is from Zanzibar. He lamented that when students on Zanzibar's scholarship turn up at Tanzania missions abroad, they are kept a stiff arm's length away on the pretext that they are not on a United Republic's scholarship, even though in fact Zanzibar pays its share in the Union's higher education budget. He contended that the executive bodies of higher education are Union only in word but in deeds and in their structure, there are mainland creatures and are there to do its biding. The Union parliament formulate policies for the interest of Tanganyika and believed that somehow the Tanganyika and Union governments are Siamese twins. During the leadership of Nyerere (1961-Present), the Christians had much freedom of their religion as guaranteed in the secular constitution, as hypocritically practiced in all other secular states. Their freedom includes secularization and evangelization of the Muslims, who were not allowed to organize themselves independent of the central authority. The Muslim affairs were articulated through a weak and corrupt organization called Baraza Kuu la Waislamu Tanzania, the Supreme Council of Tanzania Muslims (BAKWATA), which works under the protection and guidance of the government. The absence of an independent Muslim body to represent Muslims created a spiritual vacuum in Tanganyika. For three decades (1961-1990), Muslims could not exert any meaningful influence in their society according to their religion. In a bid to end this status quo, Muslims managed to form Umoja wa Wahubiri wa Mlingano wa Dini (Union of Preachers for Propagation of Religion) better known as UWAMDI, whose Secretary General is Sheikh Swaleh Uthman Ngoy. The publication of UWAMDI known as Mizani (The Balance), is very much concerned with the quality of Muslim leadership in Tanganyika because right from the start in 1990, it expressed concern about the way BAKWATA, a body created by the Nyerere's government in December 1968 to lead exclusively Muslims in Tanganyika. The Mizani issue of April 6, 1990 published the Juma'a Khutba (Friday Sermon) of Sheikh Kassim bin Juma bin Khamis, Imam of the Mtoro Mosque in Dar es Salaam, when he called upon Muslims "Kuwaondoa viongozi wa Kitaifa wa BAKWATA" (to remove the national leaders of BAKWATA) and he also stated that: "Waislamu wachoshwa na uongozi wa BAKWATA" (the Muslims are tired of BAKWATA's leadership). However, the charismatic leader behind the UWAMDI movement is Sheikh Mussa Hussein, born at Ujiji in 1918 who studied Islam under Sheikh Kibaraka Ibrahim, a famous Muslim leader in Ujiji known for his relentless opposition to colonialism in 1950s. Sheikh Kibaraka Ibrahim traveled extensively as an itinerant Muslim preacher in Burundi, Ruanda and Zaire. Sheikh Mussa Hassan also studied under reputed Ujiji Muslim scholar, Sheikh Songoro Marjani Lweno (d. 1989), who was well known for his controversial views on the Bible. His book, Mtume Muhammad (SAW) Katika Bibilia (The Prophet Muhammad (peace be upon him) in the Bible) was published in Lahore, Pakistan. Most of the famous preachers who belong to UWAMDI, and travelled under the name of Wahubiri wa Kiislam (Preachers of Islam) from Ujiji were students of Sheikh Kibaraka Ibrahim and Songoro Marjani. Among them is Swaleh Uthman Ngoy, whose main task is to answer questions from Christians, especially from Christian evangelists. As it is attested in his answers to an Afro-evangelist, Sylvester Gamanya on the divinity of Jesus Christ (pbuh), published in the Mizani of April 6, 1990. Other students from Ujiji are Othman Matata, the late Ngariba Mussa Fundi and Muhammed Ali Kawemba, the last two published a pamphlet in English, Islam in the Bible (1987) but Muhammad Ali and Othman Matata published two English pamphlets; The Message of Jesus and Muhammad (pbut) in the Bible (1989) and The Sons of Abraham (1990), the three mentioned pamphlets were published by the al-Khayriyyah Press in Zanzibar. Othman Matata, Ngariba Fundi Mussa and Muhammed Ali Kawemba were deported from Mombasa by the Kenyan authorities in November 1987 which claimed that it is illegal to address public meetings in Kenya, yet the Reverend Reinhard Bonnke, leader of "Christ for All Nations" who has a base in Nigeria and is the son of a Pentecostal preacher from West Germany, was allowed in 1988 by the same Kenyan authorities under the auspices of two hundred and eleven different Churches in Kenya. Soon after the Nairobi's Uhuru Park reverberated the gusto sounds of the "Great Gospel Crusade" of the Rev. Bonnke with his Kenyan interpreter, Rev. Masinde, the Kenyan President Daniel Arap Moi, himself a born again Christian, commended the Rev. Bonnke's Crusade by presiding over one of the gatherings. He also wished the Rev. Bonnke to return periodically in Kenya but the same Muslim scholars from Tanzania were not only deported from Mombasa for preaching Islam but they were also forced to leave their own country. Muslim professionals and intellectuals, against much opposition from the BAKWATA, managed to form in November 1992 an independent Muslims organization called the Supreme Council of Islamic Organizations and Institutions of Tanzania, excluding the Zanzibar islands because Islamists there are viewed as secessionists from the union created by Nyerere. Under his regime, the Christian missionaries were free to carry out their activities and evangelize the downtrodden Muslims. In 1982, a group called themselves as "Crusaders" toured all the regions in Tanganyika for preaching Christianity in public but Abu Bakr Mwilima, Othman Matata, Ngariba Fundi Mussa and Muhammed Ali Kawemba were barred in 1987. The state controlled media chiefly dominated by Christians accused them for "sowing seed of hatred and instability" in Tanzania. Also, Mwinyi, a Muslim from Zanzibar was openly attacked in the Christian camps. A person who managed to mobilize Christians opposed to President Ali Hassan Mwinyi's leadership to counter the "Muslim threat" is none but the firebrand and outspoken the Rev. Christopher Mtikila, a Christian Fundamentalist guru of the Lutheran Church, which was instrumental for live-broadcast of Christmas in 1982 at a national level for the first time in Zanzibar history. Being the active head of Full Salvation Church, the Rev. Mtikila is also a leader of anti-Islamic battalion when he openly declared that his Crusade to defend Christianity against Islam. He became prominent in 1988 at the CCM conference at Kizota in Tanganyika when he wrote to Nyerere, the then Chairman of CCM on behalf of the Christians opposing Mwinyi's presidency for propping up Islam at the expense of Christianity. His cyclostyled letters were circulated to all the participants of the Conference opened by Joseph Warioba, the then Prime Minister. The letter demanded to immediately investigate and rectify what he termed as a "Dangerous Government Stand" under President Mwinyi. On the contrary, the Rev. Mtikila asserted that when TANU was under Nyerere, he was fighting for independence, unity and equality between the citizens by eradicating religious discrimination. This is the travesty of truth because Nyerere in his confidential conversation on August 2, 1970, with the Rev. Robert Rweyemaum, the then Secretary General of Tanzania Episcopal Conference (TEC), the largest Christian denomination of Catholic Church, Nyerere is quoted in a book published by the Roman Church titled Development and Religion in Tanzania by Jan P. van Bergen as saying that Nyerere has established in TANU, a department of political education and deliberately appointed a Christian minister to head it not because he was a strong politician but because of his Christian faith. For this justification, Jan P. van Bergen said that the Rev. Mushendwa was put in charge of TANU's Development of Political Education because of his strong solid Christian faith. For the past three decades, Nyerere never appointed a single Muslim as the Minister for Education, yet Muslims did not complain about the Christianization of the Education Ministry which become a Christian enclave due to Nyerere’s leadership. The accusation of the Rev. Mtikila, among other Christian fundamentalists that the "Muslims' aim is to Islamize the whole of Tanzania" because Mwinyi had appointed four directors in the ministry of education is a manifestation of Christian fundamentalism. If Islamic fundamentalism is fanaticism, the same goes for Christian fundamentalism as he rhetorically stated that Muslims are endangering peace and unity in Tanzania despite the fact that peace and unity have always been the stock-in-pile of the Muslims in his country since the days of the struggle for Tanganyika independence and post-Tanzania. It is known that with the exception of the lates Sheikh Sulayman bin Takadir, Sheikh Hassan bin Ameir al-Shirazy and Sheikh Zubeir Mtevu, the Muslims in Tanganyika overwhelmingly rejected their own All-Muslim National Union of Tanganyika (AMTU) to defend national unity under TANU whose president was Nyerere. These Islamists tried to impress their fellow Muslims that Christians, even they were their fellow Tanganyikans, had a deep-seated hatred and enmity towards Muslims and that they would never treat Muslims with fairness and justice once they control political power. They insisted that after independence, educational imbalance would never be redressed and the positions of Muslims in education and other social areas would not improve significantly. Because of their stand, Sheikh Sulayman bin Takadir was expelled from his then Chairmanship of Elders' Council of TANU, while Sheikh Zubeir bin Mtevu formed the African National Union (ANC), in opposition to TANU under a Christian leadership of Nyerere. Ironically, the Churches in Tanganyika rejected TANU, twice in 1958 at Sumbawanga and in 1965 at Mbulu. They were scheming hand in glove with the British colonial government which groomed Nyerere to be the first president in Tanganyika after British. After independence under Nyerere, Tanzanian Christians are reaping what they did not plant but are enjoying the benefits of every sector cemented by Christian Church Movement (CCM) supported by the Western nations.